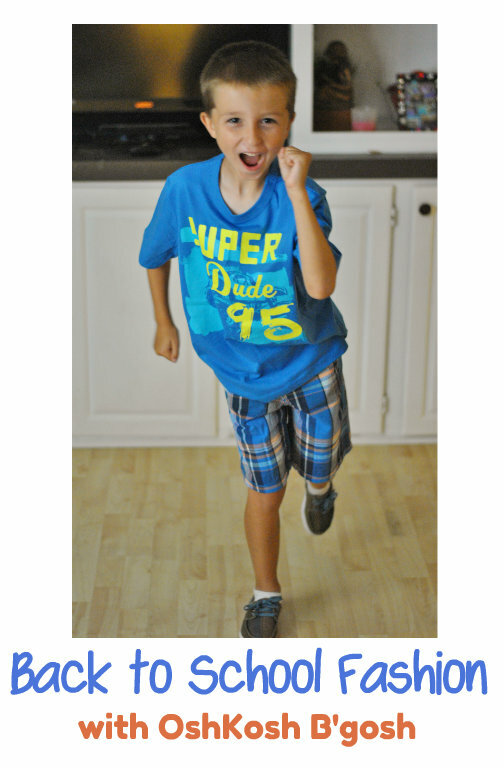 Life With 4 Boys: Picture-Perfect Back to School Looks with OshKosh B'gosh + $50 GC Giveaway! Picture-Perfect Back to School Looks with OshKosh B'gosh + $50 GC Giveaway! We just returned from our 50 day summer road trip adventure today, and already my mind is on preparing the kids to go back to school. The number one thing on our list? Clothes! One of my favorite places to get clothes for my younger boys is OshKosh B'gosh. They have worn this brand since they were babies, and since sizes go up to 12, they will continue to wear them for several more years! Not only are the style and color choices great, but the quality and prices can't be beat. Check out what OshKosh B'gosh has in store for picture-perfect back to school clothes this year, and stick around for a $50 gift card giveaway! If you have boys like me, you know it can sometimes be hard to find a variety of fun and durable clothes for them. 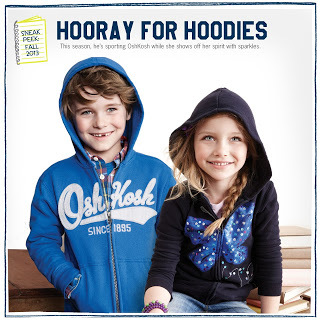 OshKosh has you covered though, with Heritage Hoodies that come in fun, bright colors. With the OshKosh B'gosh logo and a roomy fit, they are perfect for layering over a polo or t-shirt when the weather turns chilly. Boys will also love the new skinny denim, they are washed down with just a hint of stretch for comfort. Plus, they are available in fun colors like river dark rinse, indigo, cement and bright blue! Check out some of the back to school looks I have gotten for my youngest Jase so far! I obviously don't have girls, but I can't help but share the great styles OshKosh B'gosh has for girls this year! Twirly girly skirts and skorts come in florals, plaids, denim and more, plus their built-in shorts help keep girls covered as they twirl through school halls. Colored jeggings are available in a variety of bright colors and have an adjustable waist so you can get the perfect fit! Tunics and leggings complete a girl's back to school look. Available in a wide range of prints and patterns, they can mix and match for endless combinations. Slip on sneakers with updated designs for fall can top off the perfect look. If your child is required to wear uniforms to school, don't worry, OshKosh B'gosh has you covered. 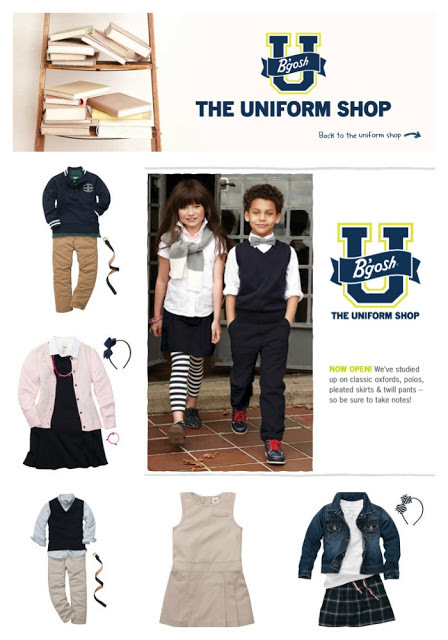 Visit their uniform shop for everything your OshKosh kid needs for school. From polos to pants to shorts and tees, B'gosh U has everything for boys uniforms. OshKosh uniforms are designed to stay soft and last wash after wash. B'gosh U has you covered for girls uniforms too! Essentials include jumpers, cardigans and dresses, with styles that are perfect for layers to keep you warm when the weather gets cold. OshKosh B’gosh partnered with bloggers such as me to help promote Back to School Looks. As part of the program, I received product or gift cards. OshKosh B’gosh believes that consumers and bloggers are free to form their own opinions and share them in their own words, and therefore did not tell me what to purchase or what to say about the products I used. OshKosh B’gosh policies align with WOMMA Ethics Code, FTC guidelines and social media engagement recommendations. The winner of any giveaway in this program will be randomly chosen and gift card fulfillment will be handled by a third party. Love the beauty and brains line for girls. Especially those little jean jacket! I love the beauty and brains outfit. my dd loves a cute jacket! I am loving Book Bound! My favorite is the Walk The Halls boys look. I like the Pumped up Pink outfit for my daughter. The Beauty & Brains outfit is my favorite. I like the black tiered ruffle jersey dress. It looks comfy and cute. I love the Bubble Dress and leggings. I love the Pumped Up Pink outfit. I like the Class President outfit. I like the tunics and leggings for girls. I love the No. 2 plaid collection for boys, so cute! I love the tunics and leggings outfits! I love the book bound look. I like the Letterman Look uniform. I definitely love the Class President set for my son! So grown up! I like the Head to toe boys outfits. I like the Letterman Look. I like the Pumped Up Pink outfit. I like the Study Hall boys outfit. How could is that? I'd love to dress my son up like that! oops in the above comment I meant, how *cute* is that? Typo sorry. I like the CARGOS & LOGOS look for fall. I love the Pumped Up Pink outfit. I know a girl who would really rock this look. I do think she would like it. I like the "Layered-Look Graphic Tee". I love he long sleeve rosette body suit!! Super cute! And him posing is priceless! You have a model in the making! I like the skort and sweet. I would buy the CLASS PRESIDENT outfit for both my boys! Oh I love the Very Varsity look! So cute for the boys!!!! I like the Boys Class President look. I like the Class President for boys look, you can't go wrong with a sweater vest. I like the pleats and pleather. I love the Tiered Ruffle Dress. I like the Ruffle Berry outfit. My daughter would look aodrable in it. thank you! I like the pumped up pink outfit, so cute! I love the Coral Bubble Dress. Thanks for the chance to win! I like the boy's CARGOS & LOGOS outfit. I love the TIERED RUFFLE DRESS. Thank you so much for the wonderful giveaway! I like the boy Book Bound outfit the best. I love the boys Cargos & Logos outfit with the OshKosh hoodie and tee and cargo pants. I love the B'Gosh U Collection. My favorite look is the Prep School Plaid for girls. the TIERED RUFFLE DRESS in all of those colors is really neat! I like the Walk The Halls outfit. I like the red Heritage Hoodie with the Camo Cargo pants. I love the Queen of the School T-shirt! I like the Puffer Vest Princess outfit. Although it's for a toddler it's still super cute! My favorite is the Cargos and Logos look for boys. "My Dad is Awesome" dinosaur screen print graphic tee. I love the girl's prep school plaid outfit! I like the Cargo's and Logos. I like Alma Mater Cool. I adore the dottie darling outfit! I like the LONG-SLEEVE GRAPHIC TEE, HERITAGE HOODIE and CARGO PANTS from the boys Cargos & Logos look. I really like the OshKosh Civvies Report for duty in these camouflage cargos. Pair with an Oshkosh tee and hoodie for basic training. "A plaid skort is school girl cool when paired with a polo and ballet flats. Denim jacket and headband with bow is a modern twist on this classic look." I like LONG-SLEEVE OSHKOSH ORIGINALS GRAPHIC TEE's.